Pacific Northwest skiers and snowboarders are suffering another winter of discontent. With snow levels remaining at stubbornly high elevations in this El Niño year and local ski areas struggling to stay open, it’s easy to give in to despair. I’ve been an avid skier and snowboarder for the past 30 years, so I decided to cheer myself up by heading to one of North America’s best powder destinations, Steamboat Springs, Colorado. It’s just a two-hour flight from Seattle to Hayden, Colorado, then a 30-minute drive or shuttle into the Steamboat resort area. 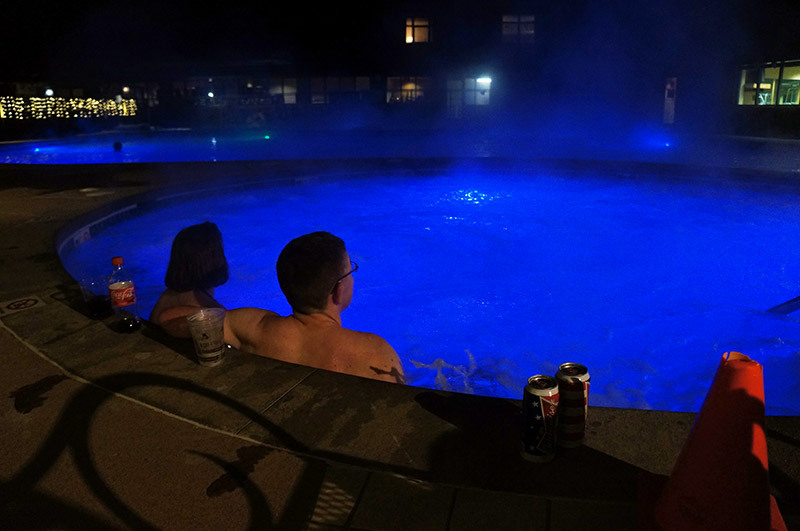 Steamboat Grand Hotel has a heated outdoor pool and hot tub open year-round. Once I arrived in Hayden, I took one of the airport shuttles that run frequently into the charming town of Steamboat Springs and a bit farther to the resort area. Many hotels offer shuttles to run guests back into town and a free city bus also makes frequent trips. I didn’t feel a need to rent a car during my three-day stay. I stayed at the convenient and elegant Steamboat Grand hotel, located right across from the ski base area with amenities such as a full kitchen, a spacious living room and an outdoor pool and hot tub open year-round. 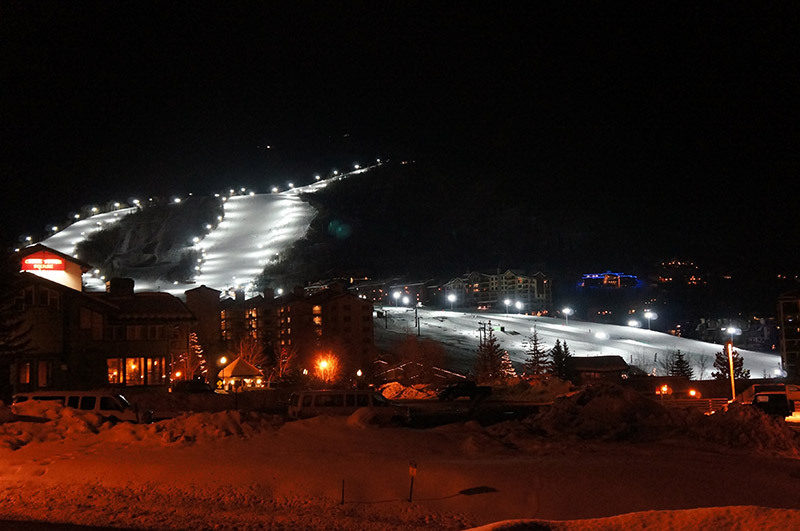 Steamboat Springs offers night skiing and boarding five nights a week. After check-in, I walked over to the slopes where Steamboat is now offering night-skiing and boarding five nights a week. Upon presenting my Alaska Airlines boarding pass, I was given a free lift ticket for the evening and enjoyed two hours of snowboarding on the lighted lower slopes before the Christie Peak Express lift closed at 8:30 p.m.
With a current mid-mountain base of 40 inches and a season total of 136 inches, Steamboat is doing just fine in the snow department. The resort has expanded its snow making capacity in the past year, an addition that came in handy during the resort’s recent cold, dry snap after a heavy dump of snow during the holiday season. 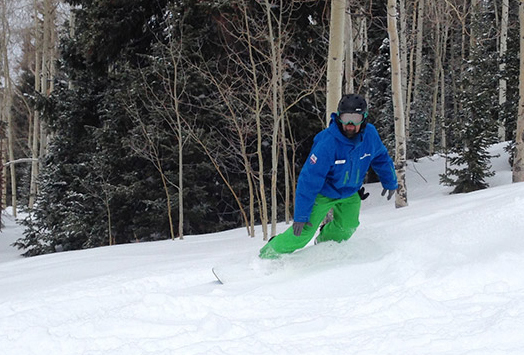 Steamboat Springs resort has a wide variety of groomed and off piste runs. The next morning I met up with Jim, an instructor with the ski school for a tour of the mountain. After a couple of warm-up runs on the corduroy of the resort’s moderate groomed areas, Jim took me to the top of Storm Peak – the highest of the lift-served peaks at 10,372 feet – to explore some of the area’s less tracked gladed runs. We raced through the pine and aspen trees on top of a layer of four inches of new fluffy powder, dodging obstacles and seeking out jumps with clear landings, shooting out at the bottom, out of breath, with big grins. Lift lines are a rarity – especially mid-week. The mountain’s expansive trail system – 2,965 skiable acres, 16 lifts and a mix of groomed and gladed runs – gives it an uncrowded feel. On a weekday, we never had to wait in a lift line. 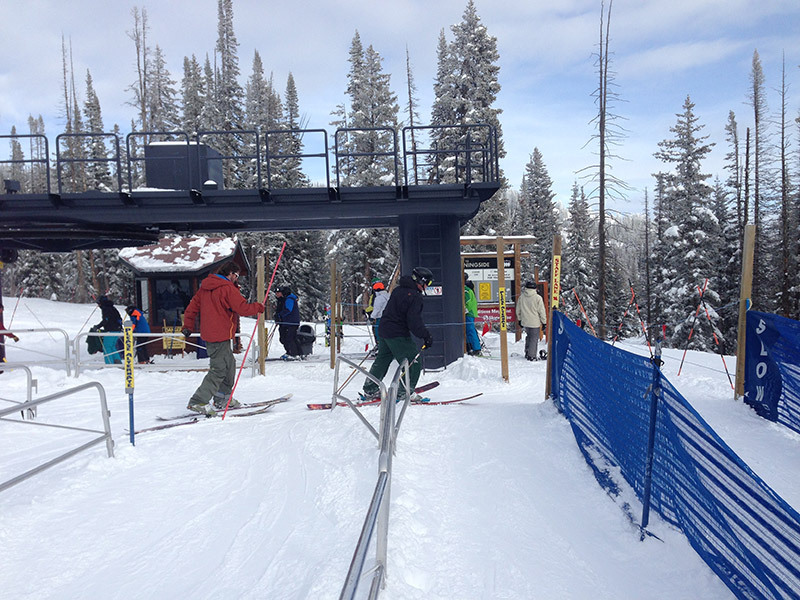 On weekends, skiers quickly spread around the mountain, resulting in short lines, except for busy holiday periods. Emily Johnston, a professional ski patroller at Stevens Pass, east of Seattle, was one of those escaping Washington’s meager snow coverage on a recent flight to the Steamboat area. Johnston said she thinks Northwest skiers are just not aware of how easy and economical it is to get to Steamboat. She flew from Wenatchee to Hayden, connecting through Seattle, and was able to check her skis for free because of the Mileage Plan promotion that runs through Jan. 31, 2015. She finds traveling by air, especially on Alaska flights, to be much more relaxing than driving. After a day of snowboarding, I was ready to try one of the dizzying array of other activities the area has to offer. All winter, visitors can attend a one-of-a kind winter driving skill class, take a snowshoe tour followed by a gourmet meal, enjoy a spa treatment or take a horse sleigh tour, among other activities. 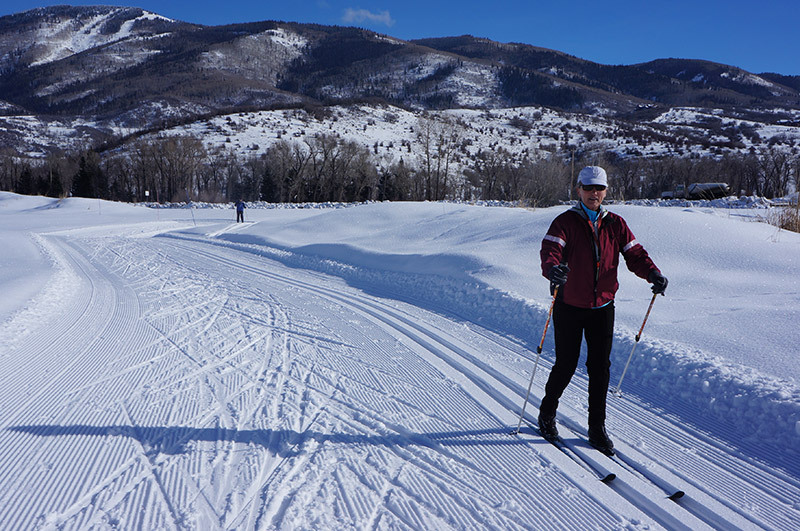 Cross-country skiing at Haymaker Nordic Center is a quiet respite and great exercise. I chose cross country skiing at Haymaker Nordic Center, just 2 miles south of town on Highway 40, and one of four groomed areas a short distance from the resort. Haymaker has eight kilometers of meticulously groomed trails on flat terrain or gentle slopes. They also offer lessons and rentals for either classic skiing, skate skiing or snowshoeing. After a few hours of skiing, the natural hot springs that gave Steamboat its name were calling. 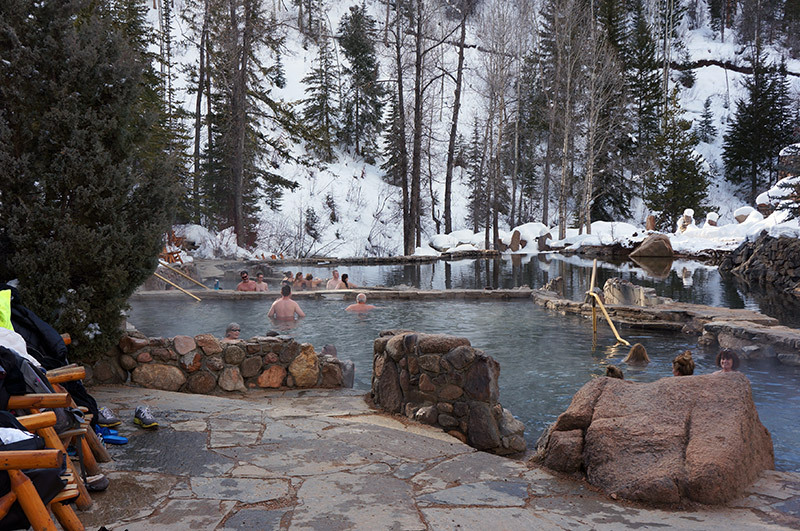 Strawberry Park Hot Springs is one of two natural springs open to the public. I took a shuttle to Strawberry Park Hot Springs, a picturesque mineral spring about 10 miles up a windy dirt road from town. The privately owned spring consists of several pools of water ranging in temperature from 101 to 104 degrees Fahrenheit and a larger frigid pool. The spring has a changing room, restroom and benches and lounge chairs. After a couple hours of relaxing, it was time to head into Steamboat for dinner at Mahogany Ridge brewery and grill, known for its locally brewed microbrews and wide selection of meats, including elk and bison, as well as grilled tofu for vegetarians like me. 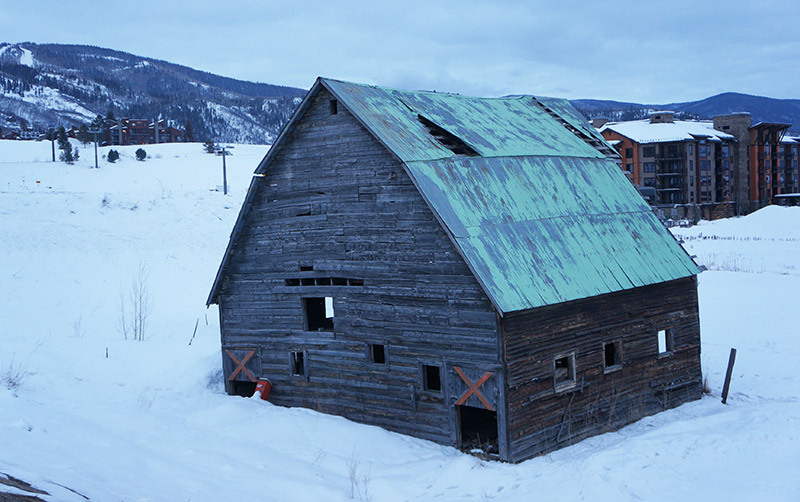 Remnants of the old Steamboat Springs ranching community mix with new condos and hotels. After dinner, I strolled through town, window shopping at some of the art galleries featuring Western art and boutiques with cowboy themes. A favorite local store is F.M. Light and Sons, which has been outfitting ranchers for 100 years and now also caters to cowboy wannabes with its wide selection of boots, hats and Western wear. My time in Steamboat was coming to an end, but I will be checking back on the Steamboat Springs calendar, which is packed year-round with festivals and events, the most recent being the weeklong MusicFest that drew some top names in country and Americana music and the upcoming Winter Carnival starting Feb. 4. Steamboat is one of many resort areas in Colorado, Utah, California, Montana or Canada served by direct flights on Alaska Airlines. Many of the resort areas that Alaska serves offer special deals to Alaska Airlines customers. Details can be found at alaskaair.com/ski.